Metal wall art is a unique type of artwork that adds dimension, depth and life to any room. And our Blue Desire metal wall hanging was designed to do just that. The large size, rich colors and abstract design create a unique and beautiful focal point to your space-whether in your living room, dining room, bedroom or office, this beautiful piece really creates an impact. Metal wall décor creates movement and motion in a way other art can't because of its interplay with light and you will see Blue Desire changing before your eyes as the light changes. 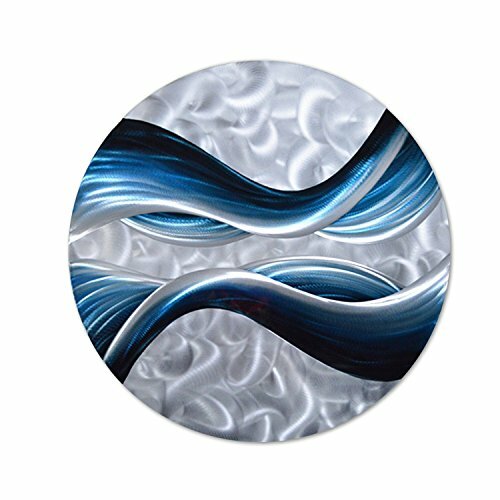 This stunning blue piece is handcrafted, original 3D art created on hand-grinded and sanded high-quality aluminum sheets, and made to last a lifetime. Give your walls something to talk about. Click on the Add to Cart button to have your Blue Desire Metal Wall Art shipped today!